The undersigned rights organizations admonish the Sudanese authorities’ use of excessive force in responding to popular protests underway since December 19, which culminated in the death and injury of dozens of people. We call on the Sudanese authorities to immediately end the use of excessive force against protesters and respond to the demands of civil society and political parties for political and economic reform. The protests began on Wednesday, December 19 in Atbara, and escalated after the government raised the price of bread and other basic goods amid generally poor living conditions, liquidity constraints, and the scarcity of many goods in the country. At the same time, the Sudanese parliament is considering amending the constitution to allow President Omar al-Bashir—who has been in power since the 1989 military coup—to again run for president after he completes his current term in 2020. What some estimated to be thousands of citizens took to the streets in Atbara, and they quickly reached al-Qadarif, Khartoum, and Dongola before spreading to other cities, including Omdurman, al-Barbara, Port Sudan, al-Rahad, al-Abyad, and Umm Ruwaba. Security forces responded to the protests with excessive violence, using not only tear gas to disperse demonstrations—one of which reached the presidential palace in Khartoum on Thursday, December 20—but also live ammunition, which has killed and injured dozens. Security forces also arrested 14 leaders with the opposition National Consensus Forces during a meeting in Omdurman, according to a party statement. Among those arrested was human rights defender Ihsan Fagiri; she was later released, according to a statement from No to Women’s Oppression. Drawing inspiration from the Arab Spring uprisings, protesters called for the fall of the Bashir regime and demanded freedom; some also set fire to ruling party headquarters. The Sudanese authorities responded by borrowing tactics from other regimes once embroiled in the Arab Spring, such as cutting internet service on Thursday to prevent demonstrators from communicating and organizing Friday protests. They shut down schools in Khartoum, while declaring a state of emergency and curfew in al-Qadarif and the White Nile and Northern provinces. The authorities also deployed a favored narrative of Arab dictators, accusing peaceful demonstrators of being led into subversive activity by provocateurs and agitators. The official news agency reported that a cell of opposition party members working in concert with armed movements was captured, offering no further details. Despite mounting casualties, the authorities continue to assert that police are responding to protests in a civilized manner and not interfering with them, according to the official government spokesman. The Sudanese regime is led by a president accused of crimes of genocide, war crimes, and crimes against humanity, and the International Criminal Court (ICC) issued an arrest warrant for Bashir nearly a decade ago. For years, Sudan has lived under the administration of this international fugitive, the regime unconcerned with his brutal record and grave human rights abuses. Citizens are struggling in appalling economic and social conditions, while many political activists and human rights defenders are forced into exile to escape torture, unfair trials, and security harassment. As the international community failed to bring Bashir and his aides to account, Arab regimes colluded with him in flouting the ICC decision, offering him protection and refusing to execute the court warrant, as part of their own endeavor to weaken international instruments of accountability for human rights violations. This will ultimately be of benefit to them or similar regional leaders implicated in grave human rights abuses. The collusion against the Sudanese people is seen not only in the protection given to Bashir by Arab League members and their facilitation of his evasion of international justice. It also extends to the majority of Arab media outlets, which are purposefully ignoring the suppression of the popular uprising in Sudan. This is because regional media by and large lacks independence and follows the dictates of the security apparatus, which fears that coverage of Sudan’s uprising could lead to similar popular uprisings in other areas suffering oppression and privation. Even Arab media outlets with substantial capacities that typically focus on political developments and human rights violations in Arab countries have failed the Sudanese people, refusing to cover their uprising due to common political interests with the Sudanese regime. 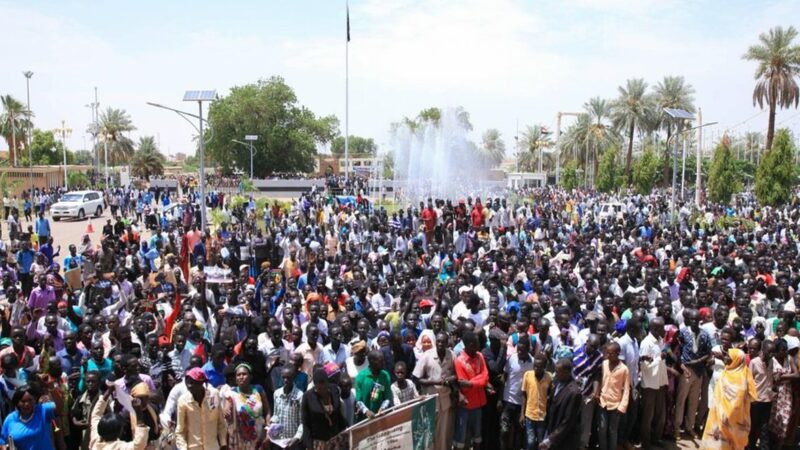 The uprising of the Sudanese people is part of the protest wave seen in many Arab states that is demanding equality, justice, and rights enshrined in the International Covenant on Economic, Social and Cultural Rights. The international community must intervene to protect the lives and rights of protesters in Sudan. It is shameful that those striving for basic rights such as bread and freedom are killed with impunity as the world stands by in silence.